Donald Trump’s election campaign has begun legal action against an ex-White House aide and reality TV star for allegedly breaching her contract. 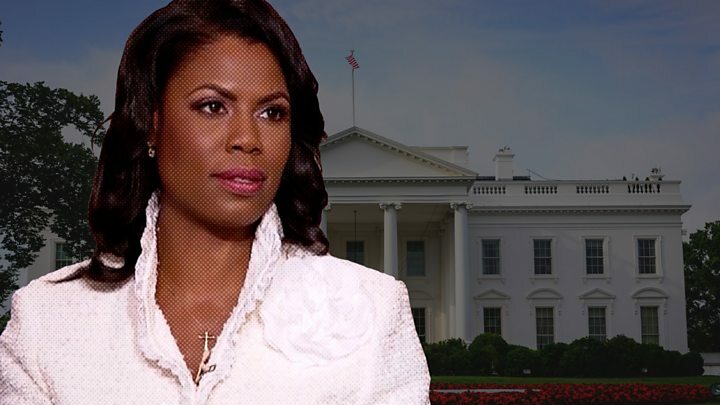 Donald J Trump for President, Inc has filed for arbitration against Omarosa Manigault Newman, claiming she violated a 2016 non-disclosure agreement. A feud between the two has escalated as Mrs Newman promotes a new book that is very critical of him. On Tuesday, Mr Trump angrily denied her claim he was taped using the N-word. Mrs Newman – a former star of The Apprentice who was fired after a stint as a White House adviser – claimed that Mr Trump was recorded using the word while working on the show he hosted for 11 years. But she has not said she ever heard him using the word himself. Their war of words hit arguably a new low when the president called Mrs Newman, who had previously been one of his most prominent black supporters, a “dog”. “She made it up,” he wrote, also calling her a “lowlife,” “a loser” and “Wacky and Deranged”. What is the legal action? In the latest development, a senior Trump campaign official sent a statement to US media confirming the legal action. “Donald J. Trump for President, Inc. has filed an arbitration against Manigault-Newman with the American Arbitration Association in New York City, for breach of her 2016 confidentiality agreement with the Trump Campaign. Mrs Newman has said in interviews that she never signed an agreement when she began working in the White House but it’s unclear if she did when she joined the Trump campaign. What’s in the Omarosa tapes? Mrs Newman has released several audio tapes of her discussions with White House staff and Mr Trump in recent days as part of a publicity tour to promote her tell-all book, Unhinged: An insiders account of the Trump White House. The most explosive allegation in Unhinged is that there is a tape of Mr Trump using the N-word during filming for his reality show, The Apprentice. A new tape released on Tuesday to CBS News purports to document Trump campaign aides speaking during the election about how to deal with the potential fallout from an older allegation that Mr Trump had said the N-word. Trump campaign advisers Katrina Pierson and Lynne Patton – who are purportedly on the new tape discussing the claim – have said in statements to US media that the conversation never took place. In his tweets, Mr Trump said that he had spoken with the British producer of The Apprentice, Mark Burnett, who “called to say that there are NO TAPES of the Apprentice where I used such a terrible and disgusting word as attributed by Wacky and Deranged Omarosa”. In another tweet he mused: “When you give a crazed, crying lowlife a break, and give her a job at the White House, I guess it just didn’t work out. Mrs Newman has known Mr Trump for almost 15 years, and appeared on several seasons of The Apprentice, where she was known to viewers as the programme’s “villain”. Her departure has highlighted the lack of diversity in senior roles at the White House, where only one black man – Housing and Urban Development Secretary Ben Carson – has a cabinet post.